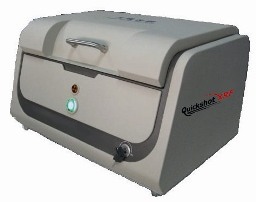 Quickshot XRF already offered a Handheld XRF analyzer for detection of hazardous substances but realized a need for analysis of small electronic components...to meet this interest the desktop QSX-82D was developed. This efficiently designed system offers the hardware specifications required to meet the rigorous demands of RoHS (and related) regulations and includes a color camera system (with crosshairs) for accurate alignment and analysis of smaller electronic components. The QSX-82D offers a top price-to-performance ratio for benchtop RoHS compliance testing equipment. This desktop analyzer has been received with excellent reviews and, with the Quickshot XRF handheld unit, provides another option for RoHS Testing. Watch the video demonstration of the QSX-82D. The video highlights the streamlined software and reporting functions. While the QSX-82D was developed specifically for RoHS related screening interests, the analyzer does offer a solution for additional quality control measurement needs. With the appropriate configuration of software and components, the system can be used for solder composition, thickness, plating solutions, and more. Review the details of its versatility. - RoHS Testing...What is the better fit, Handheld or Benchtop X-ray Fluorescence?